The last-minute "reprieve" (as some called it) for Peabody Elementary School and five other schools slated for closing or turnaround because of Chicago's controversial "Renaissance 2010" public school privatization plan was cause for celebration at Peabody. More than 50 students, parents, and friends of Peabody Elementary School joined the school's principal for what was supposed to be a protest candlelight vigil at 9:00 p.m. on the night of February 23, 2009. 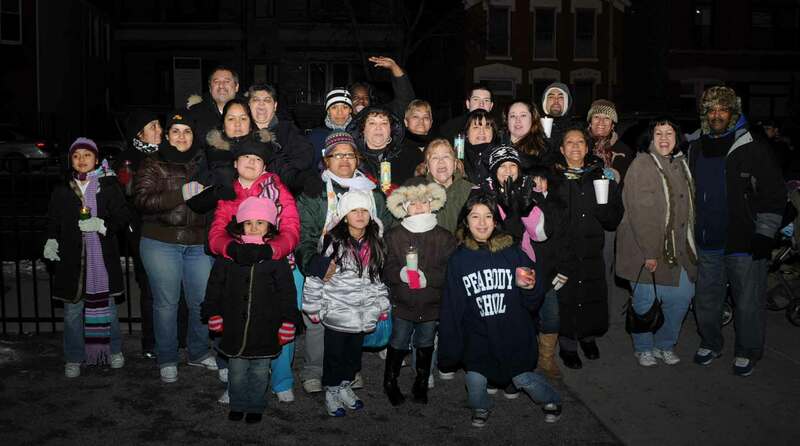 With the last-minute announcement that Peabody had been removed from the "Renaissance 2010" closing list, the event turned into a community celebration despite the cold night. None of the neighbors complained about the small amount of noise on the usually quiet public school grounds as the cold night became colder and the hour drew near 10:00 p.m. Substance photo by George N. Schmidt.The school, located at 1444 W. Augusta in Chicago, has been a community institution for generations, but even while celebrating Peabody's most active parents, students and teachers were aware that a neighbor school was still facing closing. The transcript shows how carefully Peabody handled its hearings. The following transcript was provided by CPS to Substance under the Illinois Freedom of Information Act (FOIA). STENOGRAPHIC REPORT OF PROCEEDINGS had in the above-entitled matter held at the Chicago Board of Education, 125 South Clark Street, Board Chamber 500, Chicago, Illinois, commencing at 5:30 o'clock p.m, January 29, 2009 before Respicio F. Vazquez, Hearing Officer. Reported By: Angela C. Loisi, CSR, RPR License No. : 084-004571. HEARING OFFICER VAZQUEZ: Good evening, everybody, I would like to begin. Good evening, again, my name is Respicio Vazquez. And before I start, I would like to inform everybody that on my right, your left, we do have a Spanish interpreter. His name is Jay Nazario. Is there anybody here who will require or request the assistance of a Spanish interpreter? Over here? I'm going to ask, if it's okay, for the individuals who would request Spanish interpretation, if you can move to the -- my right your left. The idea is to have the interpreter work with the individuals who need it during the hearing so that they can understand. Also, we do have a Sign Language interpreter on my left, your right. If she can raise her hand. Does anybody need the assistance of a Sign Language interpreter? No? Okay. If anybody else later on in the hearing -- we will have her available throughout the hearing but it looks like no one needs her at this time. Okay. I'm an attorney in private practice here in Chicago. And on or about January the 5th, 2009 I was retained by the chief executive officer of the Chicago Public Schools to serve as an independent hearing officer in this matter today. The purpose of this hearing is to enable me to receive public comments and concerned persons, specifically, including representatives of the CEO, members of the local school council, parents of the school students, members of the school staff, the school principal, representatives of the Chicago Teacher Union, students, and interested members of the public as to whether Peabody Elementary should be closed. 21 members of the local school council via U.S.
22 Mail and personal service through CPS mail. 1 Chicago Sun-Times and the Chicago Tribune. 18 we reach 7:30 p.m., whichever occurs first. 24 strict on that two-hour time limit. 8 people speaking at one time. 13 complete question and answer. 9 consideration by the CEO. 19 considered in my recommendation of report. 21 before the February board meeting. 2 testifying on behalf of CPS. 12 title beginning with the Spanish interpreter. 13 INTERPRETER NAZARIO: Good afternoon. 14 For the record, my name is Jay Nazario. 16 representative of Cook County. 18 the interpreter for the hearing impaired. 20 Jean, J-E-A-N, Cabers, C-A-B-E-R-S.
21 MR. L. RODRIGUEZ: Thank you. 9 ledge to my right for public viewing. 12 binder into the record at this time. 13 HEARING OFFICER VAZQUEZ: Please proceed. 14 MR. L. RODRIGUEZ: Thank you. 1 members of Rodolfo Lozano Elementary School. 4 members of William B. Ogden Elementary School. 2 the powers and duties of the board. 4 policy on the closing of schools. 11 boundary changes or reconstitutions. 22 Lozano and (c) Talcott Elementary Schools. 6 the Chicago Public Schools. 9 admitted into the record. 12 MR. L. RODRIGUEZ: Thank you. 17 in the binder at C-14. 20 evening, Mr. Hearing Officer. 23 for the Chicago Public Schools. 20 associated with the school. 6 utilization rate of 35 percent. 13 located at 24 West Walton Street. 16 and there is also a copy in the binder. 17 should the board approve this proposal. 24 be transferred to Ogden. 2 students in the Chicago Public Schools. 7 additional placements from CPS staff. 14 the closing of Peabody. 19 and stability of the schools. 3 ethnic distribution of the students. 15 I do have one question. 22 will or will not violate that policy? 1 decree I should say. 5 conditions within the decree. 10 MR. DISPENSA: Thank you. 24 MR. BURNETT: Thank you very much, sir. 1 I am Walter Burnett of the 27th ward. 3 Carpenter School and also Schiller School. 6 regards of the schools. 6 get the best education that they can get. 22 having to go to. 5 have it to go to these other schools. 20 is not in support of it either. 1 get the best education we can get. 2 Thank you very much. 5 Next speaker will be Marilyn Stuart. 7 way. Okay. I can call you later if you want. 8 MS. STUART: Yeah, let's do that. 9 HEARING OFFICER VAZQUEZ: Okay. 10 MS. STUART: Thank you. 12 just -- let's see, Erika Flowers. 13 MS. FLOWERS: My name is Erica Flowers. 20 MS. FLOWERS: I am a parent. 24 or for the proposal or neutral. 1 MS. FLOWERS: I am against the proposal. 8 only to the students, but also to the staff. 22 school, and I'm so against that. 7 that's in that area. 13 MS. DANIELS: Your time is up, thank you. 14 MS. FLOWERS: Thank you. 23 go as far in life as I want. 17 list, we are one of only eight to be removed. 21 population with free and reduced lunch. 1 and keep high expectations for all students. 5 parents work together on focused goals. 9 the extra step it takes to reach our goals. 18 push will be made to increase the enrollment. 17 part of the record as well. 18 The next speaker is Don Brown. 4 administration of that school. 9 there at that school. 14 my effort but because of the staff's effort. 3 difference to this here to make this decision. 12 not broken, it doesn't need to be fixed. 21 Paradise Cozey. P-A-R-A-D-I-S-E, C-O-S-E-Y. 3 if it's a student or not. 6 permission slip. I'm her teacher. 8 you have a permission from the parent? Okay. 18 could hand that... okay. Very well. 1 she is for or against the proposal. 3 you can slow down as well. 5 back to crossing guards. 12 teachers if we have some problems. 1 HEARING OFFICER VAZQUEZ: I'm sorry. 2 Repeat that last one. 14 speaker, Marie Lacko, L-A-C-K-O. 18 am against it being closed. 19 Peabody school should remain open. 22 137 percent over the last eight years. 11 needs to improve list? 21 students in a positive learning environment. 23 support student and school improvement. 7 MS. DANIELS: Please conclude. 9 have worked together to make a difference. 16 Peabody School and I am against the closing. 6 continued to improve yearly. 12 with the least restricted environment. 22 integration with non-disabled peers. 1 a model school for inclusion and team teaching. 5 grade level within an inclusive setting. 16 speaker is Sheila Vaultz-Polli. 19 S-H-E-L-I-A V-A-U-L-T-Z - P-O-L-L-I. 1 things that I am about to talk about. 15 school is the closest. 20 activities at those schools? 10 different gangs within that area. 15 MS. DANIELS: Ma'am, please, conclude. 20 HEARING OFFICER VAZQUEZ: Thank you. 21 The next speaker is Olga Giglia. 23 HEARING OFFICER VAZQUEZ: Giglia. 1 Giglia. That's O-L-G-A, Gilia G-I-G-L-I-A. 4 against closing of Peabody Elementary School. 16 are considered English language learned. 19 their English is very limited. 1 teaching at Peabody for approximately 18 years. 15 continued to improve year after year. 17 progress and achievement of these children. 6 this progress, please reconsider. 10 have the permission slip. 14 SELENA GUEVAS: My name is Selena Guevas. 22 either louder or closer to the microphone? 24 my parents moved into Peabody's neighborhood. 3 Head Start for -- to the elementary teachers. 8 which has given us double opportunities. 14 Please keep Peabody open. 17 B-R-I-M? Do we also have a permission slip? 18 UNIDENTIFIED SPEAKER: It was turned in. 20 oh, you do have a permission slip. Okay. 21 Can someone -- thank you. 24 And I am against. 3 we work hard to improve and get good grades. 11 graduate from Elizabeth Peabody school. 14 speaker I have is Donna Brown. 16 Donna Brown. D-O-N-N-A, B-R-O-W-N.
18 they do travel twice. 6 their team to reorganize. 19 special ed teachers has returned. 21 we really want to continue with these students. 22 Thank you very much. 7 I don't want to go to Lozano or Talcott school. 9 blocks to Lozano or almost a mile to Talcott. 18 a good teacher like Ms. Program (phonetic). 3 real world because I come to the school I love. 5 students decided to keep the school open. 12 teacher and also a delegate -- high school. 13 I am against the school closing. 20 been our sister school for over ten years. 7 today for the kids to purchase little gifts. 9 ten or more of our families to eat every year. 14 goods to donate to the Chicago Food Depository. 15 Our children at Peabody are acknowledged. 21 grades and attendance every quarter and -- day. 2 of hands in many activities. 6 classrooms. We have security. 7 MS. DANIELS: Please finish. 13 speaker is John Imperial. 14 MR. IMPERIAL: I'm John Imperial. 17 School, and I am against closing the school. 1 State -- repaired each year. 7 deal with life's expectations. 19 displayed along with several other schools. 7 only difference being that age group. 11 MS. DANIELS: Please conclude. 15 Peabody has become a Rtiz model school. 22 closing of the school. 1 services at our schools offers. 7 grants to bring more materials to our school. 12 connected math programs in sixth grade. 4 programs that caused joy to everyone. 6 of Illinois visits primary classes annually. 9 MS. DANIELS: Please conclude. 12 they are returned to the farm. 18 HEARING OFFICER VAZQUEZ: Thank you. 22 know, what your -- okay. 23 MS. STUART: Thank you. 10 members that make the decision, are they here? 21 that teaching education is about relationships. 5 hearing. Does anybody know if that's accurate? 6 No one can answer that. 14 professionals in a public school system. 5 replicating this, not destroying it. 11 utilization when we're talking about education. 17 people will be here. 12 because they're also under utilized this year. 20 closing the building. It makes no sense. 22 anti-students and teachers and unions. 13 of what you call educational reform. 21 studies that I would like to give as evidence. 23 tremendous gains over the last several years. 4 of being proposed to close? 10 school is working and performing. 14 adults who care about them. 1 school for learning enrichment activities. 4 working with first and second graders. 11 accomplish a lot at the beginning of the year. 14 MS. DANIELS: Your time is up. 18 MS. DANIELS: Ma'am, your time is up. 3 Peabody would say the same thing. 20 and drive long distances to Peabody. 4 enough skill to win an award in our area. 10 concept was based on this research. 13 trying to create in the renaissance is 2010. 19 MS. DANIELS: Sir, please, conclude. 14 estate deals and political agendas. 16 speaker is Vanessa Perez. 9 testimony which would be part of the record? 10 INTERPRETER NAZARIO: Of course, I do. 20 VANESSA PEREZ: I'm sorry. 21 HEARING OFFICER VAZQUEZ: That's okay. 5 like a home to us. 7 wanting it to be closed. 15 against the proposal to close our school. 2 and managed to stay on status. 10 in less than three years. 13 by no child left behind. 21 modeled for the other schools that are not. 4 one of our building for years. 7 student's needs and needs of the community. 10 speaker is Peter Simpson. 15 I am against the proposal. 22 school and the -- achieves. 11 the main magnet for the smaller school. 16 around the students' individual needs. 21 feel love, support, and safety? 13 parent and teachers to support our efforts. 15 MS. DANIELS: Sir, please, conclude. 4 Josiah Flomo, J-O-S-I-A-H, F-L-O-M-O. 8 about the closing of our school. 16 wants to say that is totally not safe. 2 their family members graduated from Peabody. 4 Peabody, and he wants to do it, too. 5 Every kid here feels safe at Peabody. 19 feel safe and happy. 20 HEARING OFFICER VAZQUEZ: Annie Camacho. 3 testify against the closing. 17 pass, Peabody exemplifies academic achievement. 22 CPS is trying to establish all over the city. 2 program in a safe and supportive environment. 9 excelled where many have failed. 12 us more programs to attract more students. 15 allow community to strengthen a critical asset. 17 option discussed, not the first. 23 speaker is Anthony Lacko. 1 A-N-T-H-O-N-Y, last name L-A-C-K-O. 9 someone who runs the school, it is a business. 14 hotdog vendor and let him run the banks. 20 better shape, has a better -- plan. 19 what a model school they have. 2 teacher. I am a concerned citizen. 3 HEARING OFFICER VAZQUEZ: That's fine. 6 Denice Nelson. D-E-N-I-C-E, N-E-L-S-O-N.
8 for Peabody Elementary School. 10 proposal to close our school. 13 Elementary School closing June, 2009. 10 school, bus children into our school. 12 HEARING OFFICER VAZQUEZ: Laura Montes. 14 what I have here? 17 whether you're for or against. 4 children to another school. 15 have shown great effort to help our children. 20 always aware of the well-being of our students. 24 bothers them around the school. 1 He has done a great job with our kids. 7 low income like the majority of the schools. 8 MS. DANIELS: Please, conclude. 13 close to Peabody. Thank you. 20 opposed to the closing of Peabody. 14 all about the Peabody and family at Peabody. 19 communities to get to these schools. 22 or community, concerned people like Mr. Lacko. 11 Thank you. God bless you. 18 MS. RAMIREZ: Good evening. 10 truck, in a bus, think about the economy today. 13 it -- going to close the school. 16 school if it remains cannot be just left alone. 3 ask you to think about these children. 4 Thank you very much. 6 speaker is Rosalia, R-O-S-A. 7 MS. NAVA: It's Rosalva. 11 R-O-S-A-L-V-A, Nava is N-A-V-A. 14 C-A-R-L-E-T-T-E. Is there somebody else? 20 spell your name, please. 23 I am opposed to closing the school. 7 went up to detective. 14 school by their self. 18 the school -- I mean crossing the street. 23 belongs to the neighborhood. 1 HEARING OFFICER VAZQUEZ: Nuemi Malego. 5 20 years of Peabody. 19 the kids at Peabody. 4 MS. DANIELS: Please conclude. 18 HEARING OFFICER VAZQUEZ: Rosalva Nava. 19 MS. NAVA: Hello, again. 20 HEARING OFFICER VAZQUEZ: Go ahead. 12 they have in Peabody. 15 some quota of kids going to Peabody. 19 would love to have their kids bused to Peabody. 20 Peabody is a great example of success. 24 MS. DANIELS: Please, conclude. 8 it's one name or two. 11 up. Do we need a Spanish translator? Okay. 12 If she can identify herself. 16 parent of both of these children? 17 INTERPRETER NAZARIO: No, just Flores. 18 HEARING OFFICER VAZQUEZ: Okay. 20 Flores to provide public testimony today? 1 Denise Perez, is your mom -- that's your mom. 5 (simultaneous colloquy) -- A-M-A-R-K-U-E-Z. 7 parent of the Denise Perez? 11 to provide public testimony today? 12 INTERPRETER NAZARIO: Yes, I do. 16 go together, I guess. 18 Nayeli Flores, N-A-Y-E-L-I, F-L-O-R-E-Z. 3 where I grow up and where I know everybody. 18 asking you for favors just to prove us right. 1 best school in the neighborhood. 4 MS. DANIELS: Please, conclude. 16 parent and I am against the proposal. 4 graduate in 2003 are the third generation. 17 gigantic pain of seeing my daughters crying. 8 to the closing of Peabody. 14 knew we were happy and safe and learning well. 18 anything I put my mind at -- to. 23 daughter, I knew that that was the best school. 5 baby, I want her to do good for the little one. 10 MS. DANIELS: Please, conclude. 16 exception of having my hour of lunch. 21 that don't have a way of getting there? 22 Please, keep Peabody open. 2 is Norine Gutekanst, G-U-T-E-K-A-N-S-T.
4 Schools and I am a member of Core. 8 your name is Mr. Vazquez. 9 HEARING OFFICER VAZQUEZ: Correct. 12 Peabody and you're a lawyer. 13 HEARING OFFICER VAZQUEZ: Correct. 3 where the teachers don't have any experience. 5 into the Peabody building. 20 to the good families of Peabody Elementary. 21 Who has choice and who has opportunity? 1 MS. DANIELS: Your time is up. 13 that's going to take place. 16 scheduled -- just let me announce that one. 22 limit everybody to two minutes. 8 either today or by fax at (773)553-1769.